On 4 June 2009, Reuters reported evidence of a multi-million offer from carbon brokers to PNG’s Office of Climate Change and Environmental Sustainability. Reuters also reported on sale of carbon credits from an area of forest in PNG that has not been validated. REDD-Monitor has found (on the internet) some of the documents that Reuters has seen and is sharing these documents, in the interest of transparency. 12 June 2008: Theo Yasause, executive director of OCCES, signed a government memo asking PNG Prime Minister Michael Somare to counter-sign a certificate allowing two carbon brokers, Earth Sky and Climate Assist PNG, to sell US$500 million worth of forest carbon offsets. “The (two brokers are) prepared to put in 10 million Australian Dollars [US$8 million] to assist the establishment of the Office of Climate Change,” Yasause wrote in the memo. In addition, OCCES would earn 20% of any proceeds from carbon sales. 20 September 2008: Yasause wrote to Jackson Yagi, the chairman of Hustein Range Holdings Ltd., an organisation representing local land holders. In the letter, Yasause confirms that he received a “landowner resolution empowering both you and me to act on behalf of the Landowners to produce and sell carbon credits in the Forest Management Area (FMA) in April Salome area, Ambunti, East Sepik Province, Papua New Guinea.” The “landowner agreement” is dated 5/6 June 2008. It ends with warning: “Imposters beware if caught you will be prosecuted.” Given that Earth Sky and Climate Assist PNG seem to be offering US$8 million as part of the registering process with the Office of Climate Change, it is perhaps understandable that the Office wants other carbon brokers to register. 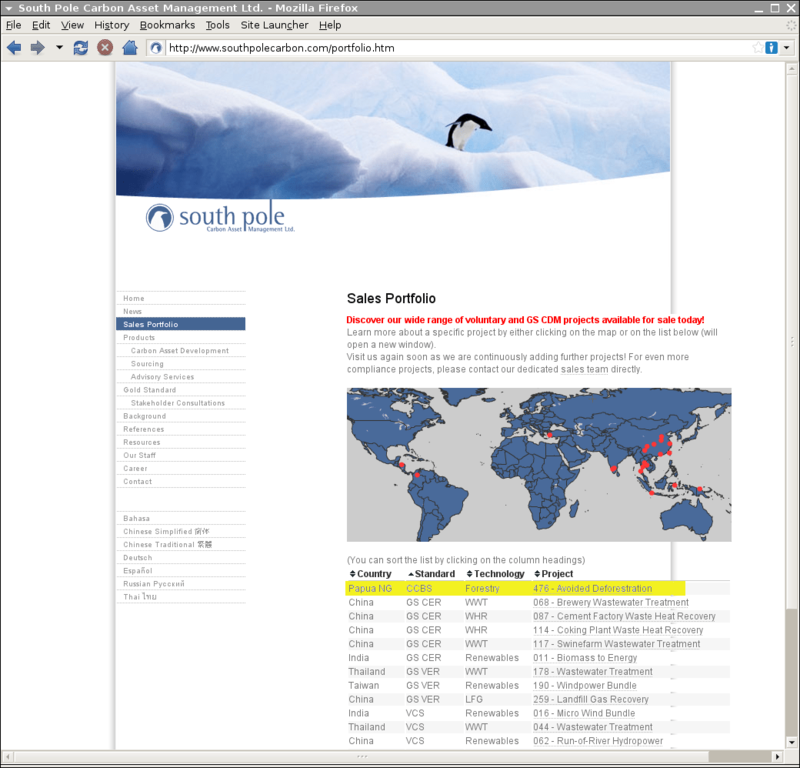 South Pole Carbon Asset Management, it seems, has no such qualms. Under the heading “Sales Portfolio: Discover our wide range of voluntary and GS CDM projects available for sale today!” a table on the company’s website lists a Papua New Guinea “avoided deforestation” project with the letters CCBS under the heading “standard”. Earthsky Ltd has initiated and managed the avoided deforestation project in Papua New Guinea. The Company personal also has experience in the management of CDM projects, of which a series will be implemented in the course of the next years. EarthSky Ltd. entered into a strategic cooperation with the PNG Office of Climate Change and Carbon Trade to support this REDD project implementation and related activities including carbon monitoring and sustainable development monitoring. EarthSky Ltd. focuses on fostering reforestation, renewable energy and energy efficiency projects with a high sustainable development impact. Projects supported will all be owned by local actors and not by foreign companies. The local landowners are represented through Hunstein range Holdings Ltd. Hunstein Range Holdings signed an agreement with the Office for Climate and Carbon Trade of PNG, requesting them for support in the commercialization and confirming that “the above company (is) acting on the behalf of the Land Owners of the April Salome Forest Management Area in Hunstein Range, East Sepik Province, PNG. They appointed Dr. Theo Yasaue [sic], Executive Director of the Office of Climate Change and Carbon Trade, to “produce and sell carbon credits” on their behalf. Theo Yasaue [sic] then teamed up with Earthsky Ltd. for the commercialization of the carbon credits and especially the development of the documentation needed, especially the baseline study, PDD, and relevant annexes. A letter to the Office to the Prime Minister confirming the cooperation and is available, additional to a letter back to Hunstein Range Holdings confirming that the office will push forward the VER commercialization. As The Economist points out in an article about forest carbon credits in PNG, “no government is able to issue any legal REDD credit, as no framework exists for doing so. Indeed, even if REDD is formalised later this year, some expect that credits would be issued by third parties not governments. Nonetheless, the government of Papua New Guinea has apparently been issuing credits.” The Economist’s investigation suggests that at least 40 REDD “credits”, each denoting one million tonnes of carbon have been issued by the Office of Climate Change. Kevin Conrad, interviewed last week, said it was too early to conclude what went wrong but said an “independent review” was under way. He added that “carbon speculators” were putting pressures on landowners in many countries to sell large tracts of forest ahead of a possible deal on avoided deforestation in Copenhagen later this year. The broader issue with any kind of carbon credit, however, is ensuring that governments of poor countries behave impeccably. Indeed, if problems like this can happen in Mr Conrad’s own back yard, it suggests that the challenges ahead for REDD are tough ones. Avoided deforestation is a big deal for climate-change policy. It is also a prize worth fighting for, even if it is hard to achieve. Poor governance, on top of poorly defined and defended forest property rights, mean that without proper care REDD could become a recipe for disaster rather than part of a solution the world needs. The only possible thing that could be wrong with the sale of credits from April Salome, is if anyone were selling actual REDD credits from the project right now. There is no evidence that this has happened. But one could not claim to have REDD credits from April Salome and sell them, because they would not exist yet. Nobody has done this, except (apprently) for a Spanish website. Have any REDD credits been issued by the government for April Salome? Not that anyone knows. But they have been for Kamula Duso, and a number of other projects. Kevin Conrad does not have a “backyard”, and it certainly is not Papua New Guinea, nor does Mal Smith Kela, so please get your facts right. Their interest are nothing more, but about MONEY and pursuing their private business interest. The role of people like HE Ambassador Kevin Conrad and Lady Federrica the “Italiano lady” who speaks for Papua New Guinea at COP meetings and on all SBSTA, SBI, KP and other contact groups, should be as advisors not as leaders. Papua New Guinea needs to be represented by elected Papua New Guinea officials in the international negotiations and on the issue of REDD and Carbon Trade. We (Papua New Guineans) look like fools in the eyes of the international community, especially the Kevin and Federica take the stage for PNG. Olsem wanem mipela inogat save man na meri bai makim mipela long toktok na tingting. Thanks Natasha. You’re right that Kamula Duso is also worth looking at in detail. I’ll do a post on that soon. Thanks for the link. I think there are other important questions to ask about April Salome apart from whether carbon credits are being sold from the project. Such as: Does Earthsky Ltd have any experience of running forestry projects? Have the Indigenous People living in the area agreed to the sale of carbon credits from their forests (whether as futures or as credits)? And what exactly was the US$8 million that seems to have been offered to the Office of Climate Change supposed to be for? The Government of PNG has established four “pilot” Projects under the United Nations Framework Convention on Climate Change (UNFCCC) for Reduced Emissions from Deforestation and Degradation (REDD) initiative and has confirmed their voluntary participation and commitment to real and measurable long term benefits of the Clean Development Mechanisms (CDM). In so doing, the Office of Climate Change and Carbon Trade was established, to facilitate the development of these projects. The OCC has created a seven step process through which each Project must pass, to achieve independent verification and recognition by commercial interests. To further enhance the validity of these Projects, it was decided to obtain dual certification under the VCS and CCBA protocols, in lieu of yet-to-be-established verification process for REDD, which is currently the subject of a some what heated world wide debate. In a sense, what PNG is doing is to provide a road-map for the rest of the world in the potential development of the REDD verification process. The most critical issue in each Project is the education and approval of the Indigenous Land Owners about the roles and responsibilities required to protect a Rain Forest against logging interests. In this respect, PNG leads all nations, using a four level process of people to people consultation, which reaches into every level of every local community within every Project area. To provide local authority independent of the PNG Government, and to ensure that the interests of the Indigenous Land Owners are protected at all stages, the final approval for a Project passes through the office of the Local Governor in each area, where the Project Developers must show that they have achieved the various stages of consultation, and have a legitimate right and mandate to act on behalf of the Indigenous Land Owners. Once they have passed this stage, they are enabled to take their project to the OCC for endorsement. Because this has never been done before, and because of the world wide attention the projects in PNG are attracting, the OCC has invited senior representatives from a recognized independent Verification authority to physically inspect and audit the processes used to achieve recognition of the dual verified carbon credits. This is the highest level of verification any project in the world will have received since Carbon Trading began. The issue is not about the commercial entities, the credits, the politicians, the illiterate and warped news reports, or the inaccurate and falsified blogs, or any of the thousands of vested interests vying for their 15 minutes of fame. The issue is about keeping the Forests of PNG intact, and allowing the Indigenous Land Owners to continue to live their normal lives, while providing a carbon sink that could well help save the Earth from global warming. And giving the Indigenous Land Owners a return for protecting the very thing they love the most – their forests. When you talk to the People who own the forest, who rely on it and its biodiversity for their livelihood, you come to understand how tragic the rapacious logging has been over the years. Millions of hectares chopped to destruction for short term gain by foreign interests, landscapes ruined for decades, and indigenous people disposed of both their livelihood and their homes. The story can now be different, as illustrated by the 52 Incorporated Land Groups who own the 800,000 pristine hectares of natural tropical forest known as Kamula Doso. These “ILG’s, as they are known, have formed themselves into a Corporation called Tumu Timbers, and have worked very hard for over two years with the OCC to produce the very first pilot project that is now being independently verified by both the VCS and the CCBA. When this detailed and complex verification process is completed sometime in the next few months, it is expected that the VCS will issue on behalf of the people of Kamula Doso a number of Carbon Credits each representing one cubic meter of carbon absorption per year. The process is very simple, and is as old as Time itself. The trees, plants, and the biomass of the tropical forests pull carbon dioxide out of the air, and combine it with water and nutrients from the soil, and make oxygen, which is released back into the environment. This natural process is called “photosynthesis”, and is the stuff of Life! In the old way, the trees were willfully chopped down, and produced a small income for the local people just the once, but destroyed the forests in the process. Sometimes it takes forty to sixty years before regeneration takes place to a sustainable level. This means the forests are denied to the Indigenous people for generations at a time. With the new way of saving the forests as a carbon sink, the people are well rewarded year after year, as well as enjoying the benefit of their forests remaining as they were naturally created for – to provide homes, food, and a livelihood for the indigenous people. And to soak up the carbon monoxide created by industrialized nations like yours and mine. If you can really find fault with the honest desire of the People of Papua New Guinea to save their tropical forests from logging, and help save the planet, then you are indeed someone who needs to take a walk – perhaps through the pristine forests of Kamula Doso, to see for yourself what we will all loose if the persistent attacks on the Indigenous Land Owners are allowed to continue. For me, it is about the trees, and about my children being able to breath fresh air! Sadly, the poor standards of reporting that the modern generation have adopted have never been more in evidence than over the past month. You’ve seen the result of in on these very pages. One Newsgroup writes a story, full of innuendo and mistruths, and even a few unsubstantiated accusations, all written from the comfort of someone’s bedside or bar – and hay! Presto! Other Newsgroups, without ever bothering to check the original garbage, rehash their own version of the fiction, carefully quoting some of the original source to protect themselves from being sued. It’s not that this is a lazy way to make a living – it’s just a stupid way to behave as a so-called professional journalist or writer. As in any profession, once you have shot your credibility to pieces, and lost the trust of your readers, you have no value to them. You just become a joke. And what you write about so piously, laughable. Oh! And one more telling fact – none of the writers that pass these toxic stories to one another, either as articles or irresponsible blogs, ever actually go to the point of origin to verify anything. In the “new” world of instant media, laptops, wifi, and soggy blogs, they would rather sit around in their pajamas feeling superior, than do an honest job the “old fashioned” way – you remember, the one where a great reporter checked their story with at least three different, independent sources to ensure that they were writing about the truth. A blind phone call in the middle of the night isn’t a great way to establish anything, other than the deep suspicion that you are setting up someone to be the brunt of poorly worded attack. Take the case of the so-called “Carbon Credit certificates” that have featured on these pages and others. The dialogue has revolved around words like “fake”, “illegal”, “counterfeit”, and “stolen”. When one reporter (and I use this term loosely) did try to find out what they were, they were told that the certificates were “symbolic”. That should have got their enquiring mind started on the right track, but instead they chose to continue their rant and accuse everyone of all sorts of different behaviors, from “issuing and selling false credits” to “dealing in non-existent credits”. They even went so far as to accuse an Australian Company of “selling these illegal credits” to a third party. You will not be surprised to learn the truth. The “carbon credits” were indeed symbolic certificates designed to represent what the Indigenous Land Owners might expect in two years time for all their hard work. Not issued by the PNG Government, but issued by the VCS after an exhaustive verification process that is currently in train. You see, the Indigenous people of Papua New Guinea, in the main, do not have English as their primary language. They do not have laptops on every table – in fact, it would not be an exaggeration to say that the majority of the people who live and survive in the tropical forests, and in fact own the land, do not yet know what the www is. The real world outside the narrow vision of these destructive blogers understands this, and this is why local consultation and education about carbon trading has been mandated as a critical aspect of creating a potential REDD Project, currently under the VCS / CCBA verification process until REDD is accepted later this year, or next. So representative, symbolic “carbon credits” were printed so that the Teachers and Educators could show them to the people as they went from village to village, doing what we in the so called modern world would recognize as a simple “show and tell”. After all, you can’t “see” carbon being absorbed by the forest, only breath the result! So how would you go about explaining the concept of trading carbon credits (and for that matter, the whole offset scenario) to a group of indigenous people living inside a massive tropical forest? And incase you think that this was an unnecessary process, consider this. In just the last few weeks, as factually reported in local newspapers last week, unscrupulous men have been going from village to village taking 1800K of everyone they could con, on the basis that “money will now fly out of the sky” because of the “carbon trading” they were now involved in. And we did. And we talked about many things, and as each person said their final goodbyes, and headed back off into the jungle, on foot, with only the clothes on their back, I was left with an amazing feeling that I haven’t experienced in years in any “modern” meeting. What had been promised would be done. Maybe not by two o’clock tomorrow, but certainly by next Tuesday, or perhaps even by Wednesday, but it would be done. And it will be done by people of great integrity and intent, fighting for their livelihoods and way of life in an ever increasing cauldron of media generated suspicion and potential commercial exploitation. There is one fact that is becoming powerfully self-evident concerning carbon trading in PNG. The people own the land on which the trees so proudly grow. The people no longer want to chop their trees down for short term gain, of any sort. The people want carbon trading, the people will support it, and the people will control it. They might not get everything right the first time, after all, the REDD process is new to everyone in every country – but then, do you get everything right the first time you try it? There is one glorious fact that you can see for yourself – the tropical rainforests of PNG will continue to stand tall, providing a breath of fresh air for us all. REDD is a forestry issue from start to finish. REDD, if reduced to the lowest common denominator, is nothing but sustainable forest management. eNGOs have been asking the logging companies and the PNG National Forest Authority for years to do sustainable forest managenent, but little or nothing has been done to show that our forests are sustainably managed. Now with carbon trade coming into the equation, other people have hijacked REDD because of the billons of dollars attached to it. Firstly DEC hijacked it and then OCCES is now running the show, while the forestry sector is all wrapped up and sitting in one corner not knowing what to do. Please for one moment why don’t people mind their own business and leave forestry’s business alone. For years non-foresters have beeen running the affairs of forestry, and history shows that only 2 foresters (Andrew Yaieb and Kanawi Pouru) have been permanent Managing Directors of Forestry in the last 33 years; all the other bosses were lawyers, economist and what not. Today, when we want to trade carbon from our forests, non-foresters come and hijack REDD from forestry again. I find it hard to understand the logics behind all this insanity and wonder why this people never thought of studying forestry in the first place. Money, money, money is cause of all this insanity. With all the scams exposed now, one can really see that REDD was primarily hijacked for money. Nothing else. So why dont we make its simple. Give back REDD to the forestry sector to deal with, give other anthropogenic emissions like fossil fuel back to Petroleum and Energy, give disaster mangement to Provincial Affairs to deal with, and let OCCES be the coordinating agency. This simple proposal can remove corrupt practices and we can trade carbon credits from our emissions to fulfil international obligations. One issue being harped upon by the toxic media and bedroom blogers is that monies have been paid to develop projects in a country where no formal climate change policy exists. In the case of PNG this specifically means a REDD policy. Answers have been demanded to questions such as “why is A or B or C providing funds for the development of projects when no policy exists?” insinuating that this practice is either corrupt or stupid or both. The simple truth is that since the inception of the OCC, PNG has been developing its formal REDD policy. This is now a multi year process. It may take another year or even longer, before a formal policy is reached. This is also why the OCC created the four “pilot” Projects – to help the people learn how to set up, manage, and run a REDD project. Those of you who have experience of large scale project management will realize that experiential learning is the most efficient and sustainable manner for people to grow and develop within any environment. It’s the human condition! At the current time other developing nations are creating almost identical climate change policies, including REDD sub-elements. None are yet complete, in fact many are far from it. They include Indonesia, Malaysia, and Brazil. Yet each of these countries have had REDD Project Developers investing and operating for some years without their formal policies being concluded. Are the Project Developers in these countries stupid or corrupt or both? At the current time, billion of dollars are being invested into climate change related projects into the US, which has only just entered the climate change agenda under the Obama Administration. They are still developing their formal climate change policies. Why aren’t the Project Developers investing billions in the US considered in the same vein as PNG Project Developers? What about Australia? The Federal Government may undergo a double dissolution of Parliament because both sides of the House cannot agree on the implementation of the right climate change policies for the country under its planned Carbon Pollution Reduction Scheme. It has not stopped hundreds of millions of dollars of investment. Is this stupid or corrupt? Look at India and China. Literally billions of dollars are being invested in climate change projects and yet neither nation has agreed to ratifying targets under a formal climate change policy for the next protocol. If you are going to comment, discuss, debate, or report on this subject, then perhaps it would be wise to learn the landscape that you wish to comment on. And if you are going to criticize, berate, create mischief or attempt to embarrass those who are committed to the preservation of the world’s rainforests and its indigenous peoples, at least come to the party with some credibility and knowledge. For weeks, irresponsible so-called journalists and blogers have been repeating the same fiction regarding supposed injunctions or court actions “pending” over the pristine forests of Kamula Doso. They have done this to imply that the current verification process the Incorporated Land Groups are going through with the VCS and CCBA is possibly tainted. PNG has one of the simplest, and open court systems in the world, getting cases before the courts in a speedy and efficient manner. And in most cases, when judgment is handed down, it is published word for word, for all to read and understand. That’s why I have so much difficulty understanding how so many people can continue the fiction that there is any court activity at all – let alone an injunction – over Kamula Doso. If you care to check the court records (and of course, journalists and blogers would never do that, would they?) you will find that the last statement issued by the court was that all parties to the protest made by the logging companies and their supporters against the statement of the people who actually own the forest, would enjoy a final hearing back in February of this year. The people who owned the forest turned up; the company that holds the valid, legal, Government mandate to develop Kamula Doso as a REDD Carbon Trading Project turned up; and a lot of very interested land owners from other areas also turned up, some of whom had walked in from their forest homes over the three preceding weeks. But the logging companies and their supporters failed to show, completely vacating their position to any claim over the forest, and voiding all legal proceedings beyond that time. And this is spelled out clearly in the subsequent court documents. So the only real continuing threat to the forests of PNG is still the ever increasing cauldron of media generated suspicion and potential commercial exploitation. So let’s look at the other fiction that keeps making the toxic headlines of the bedroom blogers. Then how come all 52 Incorporated Land Groups, representing the hundreds of Indigenous Land Owners and occupants of the forest areas that make up Kamula Doso, agreed and signed into force the following resolution : “Kamula Dos FMA&TA is now approved by the BOD through landowners to be changed from FMA logging to Carbon Trade project”. Isn’t the truth a real breath of fresh air? How many hectares is this project and what amount of credits are they looking to say it produces per ha? What standards are they being set to? if they are set to vcs standards then surely the project will be on the vcs web site? i cant find this project on either the vcs web site or the ccba website? to be fair the vcs website is only for registered projects so they could be in the process and if so i would have thought that their pdd would be available? Can you please tell us exactly what your interest is in all this? Who do you work for? Currently South Pole is acting as PDD developer for the Papua New Guinean April Salome Sustainable Forest Management project and supports it in the carbon development cycle. By entering the REDD carbon market local landowners aim to generate funds to be used for projects that support sustainable livelihoods. Such funding would replace the income streams that would alternatively come from handing out logging concessions to international logging companies. This has been common practice in Papua New Guinea, and logging concessions have been planned in the project area since 1996. The project aims to be registered under the VCS, which sets clear rules for REDD projects, if a suitable methodology for Avoided Deforestation and Forest Degradation projects is approved under the VCS in the near future. No carbon credits have been issued so far, and therefore no issued carbon credits can yet be sold. The project also aims to be registered under the Climate, Community and Biodiversity Standard (CCBS), but its validation, verification and registration process has not yet been concluded. You could try asking South Pole Carbon Asset Management for a copy of the Project Design Document. Wari Iamo to head OCCES? This is double trouble. This man is no different from Theo Yasuase. He has the same interests as Theo Yasause. Wari Iamo wanted this job all along, but Theo Yasause took it away from him. Now he gets it back on a golden plate. When OCCES took away Climate Change from DEC, Wari Iamo restructured DEC to make money through the golden triangle and other means. The restructure of DEC, which is yet to approved, will see DEC become a money making body rather than a regulatory body. Wari has removed conservation from DEC since it does not make any money for the department. Now that he has OCCES under him he be laughing all the way to the bank. Wait till you see what happens. May the God of Israel save this country and its people from people like him. PNG has no national framework in place to date on carbon trade. OCCES was too quick to venture into REDD especially for April Salome. Landowners regard the Deal with Earthsky, Hunstein Range Holding Limited and OCCES an illegal one. In the heart of the 521,000 hactares of untouched rainforest of April Salome, lies the 220,000 hactares of Wildlife Management Area (WMA) under PNG Consfervtaion Law – Fauna Protection (and Control) Act. The area is in National Gazette since 1997. The Villages of Igai, Wagu and Gahom from the Bahinemo Tribe owns the area. I being a principle landowner there have no idea about whats happening. The carbon deal is done without knwoledge and consent of the entire villages of April Salome and not just the WMA. WMA is a legal entity in the area, which means 220,000 of the 521,000 hactares of forest is not accessible by Hunstein Range Holdings Limited and therefore will never be accessed by the earthsky, or South Pole as its agent. Local people have demonstrated their opposition to deforestation and thus by REDD definition, WMA is qualified for it. FMA is forgetable dead concept for WMA villages. Hunstein Range Holdings Limited is led by Jackson Yagi who do not have support from all villages of April Salome. Therefore it is important to know that Hunstein Range Holdings and deals it makes will always have carry high degree of errors on landownship and forest accessibility rights. I think OCCES should provide an enabling environment as a government agency for the landowners themselves to particpate in the carbon credit markets whether it be REDD or CDM Projects. Finally we are not happy to learn of the existence of an entity called April Salome Sustainable Forest Management Project Foundation. This is a monster we are not aware of. Please help give me information. Should you need to know more about the standing of the local people, tell me know. I am a final year student of the University of Technology studying ‘Communication for Development’. I am writing my dissertation(final year degree paper) on ‘Communicating awareness of the procedures and processes used and applied particularly in the financial transaction of Carbon Trade. That means that, the cash from the sales of carbon credits by the developed country to the developing country. Please answer questions like, how and through what process or steps would be applied to bring the money from carbon credits buyers to the rural forest and landowners.Identify the middle men that are eligible to transfer funds from the donors to the rural forests and landowners and their respective responsibility. @Ben, these are good questions – but I think you need to address them directly to the organisations involved: Earth Sky, Climate Assist PNG, the Office of Climate Change, Hustein Range Holdings, South Pole Carbon Asset Management and the April Salome Sustainable Forest Management Project Foundation. REDD-Monitor would love to hear their replies. In PNG 97% of the Land Area and certainly 99.9% of the forest areas are owned by the local landowners. There is no two way for someone or the government to say I am the landowner. Land tenure systems in PNG are very complex with over 845 cultural groups who speak totally different languages. In PNG a lot of tribal wars have been fought over land related issues. It won’t be any easy for REDD to take precedence if landowners totally some millions are not considered or involved in the initial phase of such (REDD) development. Unfortunately, REDD could possibly become a paper REDD unless the issue is addressed from bottom up approach and certainly landowners need to be seen as benefiting from their forest. Otherwise it is all hot air talk right now. According to the Jungle Law Book, “You can only do business in areas where you have your foot prints left”. Therefore, If the Government, so called consultants and carbon brokers have been as far as Port Moresby than that is where their bucks stops, “You have not been to PNG”. PNG forests are the lifeline of local communities and no one will speak on how they should live their life’s. What is the process and procedure for local landowners to participate in REDD initiative (that is a policy and law question, does PNG have a policy and law on REDD? What is the check list for the local landowners to be involved needs to do to become a disciple of the REDD initiative? What is your offer to the landowners in exchange for the use of their forest in the REDD initiative or what is the benefit sharing agreement and arrangement? Are local landowners being protected from exploitation? Above all who’s interest are we discussing here? It will be a shame and a waste of time if we cannot adequately answer those questions. Most importantly, if the REDD issue gets the blessings from developed nation in December 09 in Copenhagen, REDD could become an hot issue for tropical rain forest nations whilst developed nations can keep on pumping hot air laden with GHG. Sometimes one wonders if civilization has taken precedence over intelligence on whether or not we are fighting a losing or a winning battle against Global Warming. One thing that always comes if there is money to be made is greed, unfortunatlly it destroys something good in this case. But there are other ways. I am working on a REDD project and including directly other reforestation/ afforestation projects with it to get income to the small farmers and landowners. For the forest protection we involve people who make their income now with illegal logging. This was a biggest hurdle to get them on our side since there is no other source of income. Overseen of the local area is being done by the majors of each specific area. Monthly inspections by us determine the amount paid into the community based on the reduction of illegal logging. In addition money is going into the communities for sustainable reforestation/afforestation. This again brings future income with the possibility to build legal sawmills, charcoal making, furniture shops etc. as long as it is sustainable managed and income provide to the families in those areas. Not to forget, we are going to make money too, but not as much as in Papua New Guinea, and not immediately. My fathers and I are landowners of very large land mass of virgin forest in the Kabwun district of Morobe, PNG. We as landowners would like be well informed about REDD and the business of carbon trade in the latest form, and especieally the policies made for such a trade. We want to be well informed in order to avoid being conned or fooled by “so called” carbon trade investers who deal voluntary or mandetory.please reply to this email. Google tried to deliver your message, but it was rejected by the recipient domain. We recommend contacting the other email provider for further information about the cause of this error. The error that the other server returned was: 554 554 delivery error: dd This user doesn’t have a ****.com account (benjibasa@****.com) [-5] – mta194.mail.sp2. ****.com (state 18). Just to let everyone know that the real people of April Salome are not and havenot been informed of this project. The people of Wagu, Nigiru, Kagiru, Gahom, Bitara, Bugapuki are lost because a few individuals have taken them for a ride. Proper briefing of these people need to be conducted. I hope the real indigenous people do not miss out on what is righfully theirs. These people own that land and therefore it is out of respect that they be properly briefed. For Mr. Mondia’s benefit (or ignorance), Mr. Mal Smith Kela is a greenie like yourself. Thats what he believes in doing whilst living on this planet. Comments like him not having a backyard is a racist comment and un-melanesian. We know he owns land, property, pigs and dogs, a village and even a small creek and a forest which he planted himself.He pays more taxes to the state. So your comments cannot be taken seriously by the public. Come on lets be fair to him. Tok tok lo bikpela samting. Liklik samtubg nambaut ya,.. lusim! Yu lida tumas ya! The April Salome REED + project was hijacked by all Papua New Guineans at all levels of government. The Executives of Board of Director of April Salome Forest area were affected with the passing of its founder and Director late Mr. Jackson Yagi. Bogus Executive groups were form over night with the intention to benefit from the project. The landowners after reporting fraudulent dealings are now organised with legitimate landowner executives in place to partake in REED project in Papau New Guinea. The National Government had successfully through the Minister for Climate Change conducted its own landowners meeting in township of Maprik in East Sepik in June, 2018 to identify Landowners. The Executive Members of the Hunstein Range Holding Ltd, consisting of ILG groups from the affected April Salome VCT areas are now ready to sell carbon to buyers. Captain Tom Yagi is now the chairman of April Salome REED project along the Hunstein Range area in Papua New Guinea. The landowners meeting in Maprik recognized the election of the chairman of the REED project in the country. The Consolidated company known as Hunstein Range Holdings Ltd is now officially the landowner company responsible for carbon trade on behalf of April Salome Project area.